How much good could you do if you had over $18 million to donate to charity, and 30 years available to donate your time? Could you make a meaningful difference? In the last four years, Mazda has been able to make that a reality through the Mazda Drive for Good program. This unique program involves every Mazda employee in North America, Mazda dealerships, and the greater Mazda family–and you can get involved, too. To-date, Mazda employees have completed more than 197,000 hours of volunteer service to local and national organizations, and have pledged an additional 67,500 to be completed in 2017 as part of Mazda Drive for Good. That works out to over 30 years of volunteering, all resulting from vehicle test drives. The Mazda Drive for Good program doesn’t stop with volunteer hours. For every Mazda purchased during the annual drive event, the company donates $150 to charity. When an owner purchases a new Mazda during this time, they have the option to direct that $150 to one of the national charities, or a local charity partner of their dealership. Money that is not directed to an organization by January 31 is distributed to one of the partner charities or other charities doing good work in their communities. In the last four years, the program has raised more than $18.4 million for national charities including St. Jude Children’s Research Hospital, the American Red Cross, the American Heart Association and the Mazda Foundation, as well as local nonprofits throughout the United States. 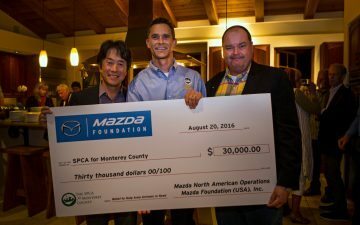 In addition to selecting national and local charities, Mazda began a partnership with NBCUniversal in 2014 to hold a nonprofit charity contest. As the grand prize winner of the Mazda and NBCUniversal contest, My Block, My Hood, My City received a donation package valued at more than $30,000. The four runner-up charities each received packages of $10,000 in goods and services. The runner-up charities for 2016 include Elevating Connections, Erin’s Hope for Friends, Move for Hunger, and Warm Winters. More information, including a list of the 2016 Mazda Drive for Good partners, is available at www.mazdausa.com/why-mazda/drive4good.